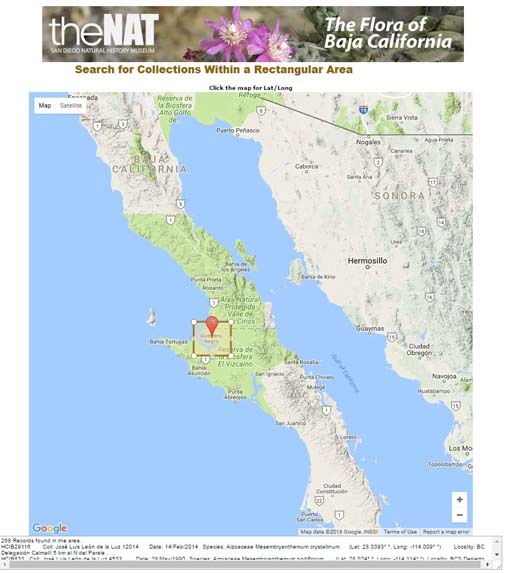 The Baja Flora website offers many ways to use the data and information from the Baja collections maintained here. On the home page, the drop-down menu items provide access to all features. The Introduction menu presents links to this website description as well as some general introductory material. The Maps menu links to a number of maps including historical map overlays that are geographically fitted to Microsoft Bing Maps. 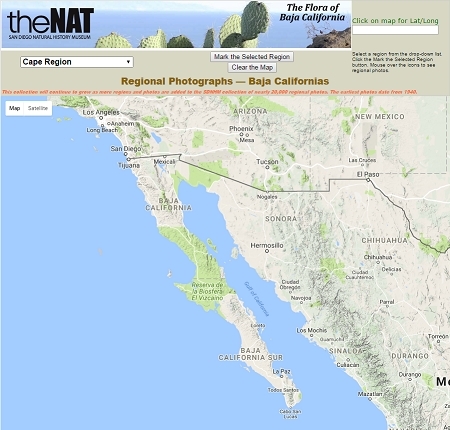 The Photos menu includes links to the pages of plant photos and Baja regional photos. The Checklist menu links to tools for searching the new Baja checklist as well as some checklists of islands. The Documents menu will serve up the searchable historical notebooks of Dr. Reid Moran and other documents that users may find useful. The Searches menu provides tools to search the collection by plant names and by specific geographical criteria. 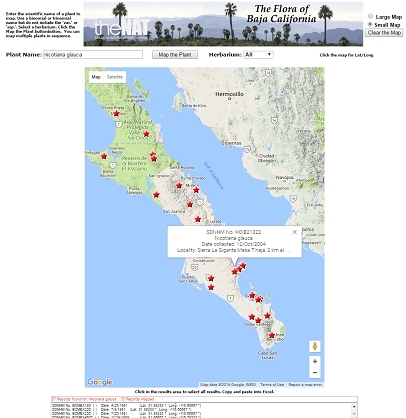 The Mapping menu presents tools for mapping collections by various criteria. Baja Checklist by Family The Checklist by Family presents the complete checklist with all species listed by family. Use the drop-down list to select a family. (To find a family, use the Search Genera and Species Name page described below. Or use the Search by Common Name page also described below.) When a family name is selected, a complete list of all the species in that family will be shown. The list includes the plant name and an English and Spanish common name. The Voucher column has a link to the scanned image of the voucher(s) for that species. The SD Photos column has a link to the photos in the SDNHM collection. 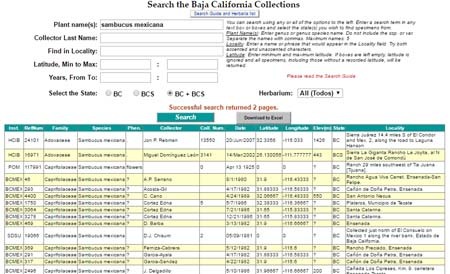 The Baja Collections column has a link to the specimen collections for the SDNHM and contributing herbaria. The Map Species column has a link that will present a map of the collected specimens of the species. Checklist The new Baja checklist includes nearly 4,000 species, over 1,000 more plants than were covered in the previous checklist, Wiggins 1980. The website includes two tools to help navigate the checklist and find names and synonyms. The Plant Names and Synonyms page provides a tool to search any plant name or genus to determine the status of the name or to find all current names and synonyms that include the specified genus. 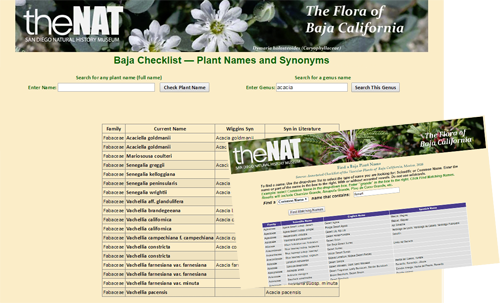 In addition, the Plant Name Finder can be used to find a plant name by searching with any part of the scientific or common name (English or Spanish). Searches Database text-based searches are very flexible. Users can specify any one or more of: multiple plant names, collector's last name, part of a locality description, mnimum and/or maximum latitude, To and/or From dates, one or both states, and a specific herbarium or all herbaria. Results are presented in a paged display or can be downloaded as an Excel spreadsheet. 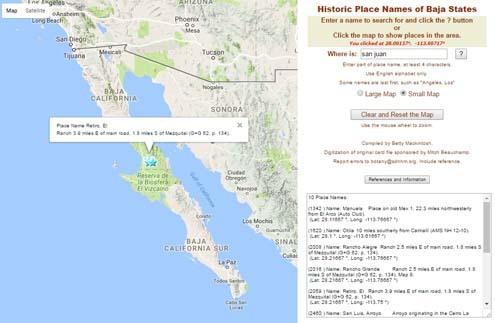 Place Names We maintain a database of historic Baja place names to assist in searching the collections. There are nearly 3,200 place names, each with a geographic position. The Historic Place Names page, found under the Maps menu can be used in two ways. A user can click on any location on the map and all place names in that area will be marked and the information about the place will appear when the marker is clicked. Alternatively, a user can enter a name or part of a name in the search text box and all the places that match that critera will be marked on the map in the same way. Searches menu presents a number of tools to search by geography. The simplest of these is the rectangular box query. When this page is opened a small box appears on the map. Using the mouse, the box can be dragged to any location. The box can then be resized with the mouse using the handles on the corners of the box. Size limitations apply. 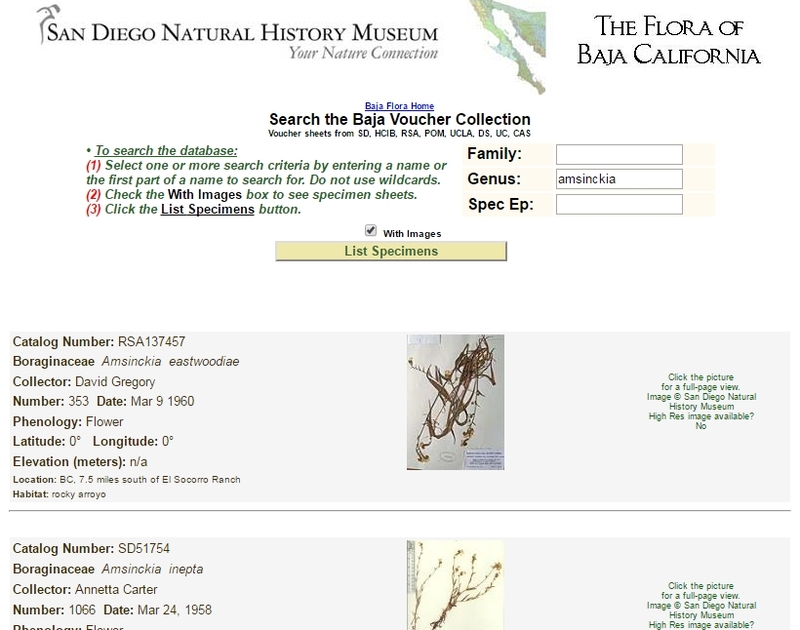 When the box is located and sized as the user wishes, clicking the search button results in a listing of all the collections found from any of the herbaria from locations within the box. The list of results is presented in a box below the map. Clicking in that box selects the complete set of records which can then be copied (right click, Ctrl c) and pasted into an Excel spreadsheet. For more control over the area to be searched, users can select Polygon searching. The user can draw a polygon on the map and execute the search for collections inside the polygon. 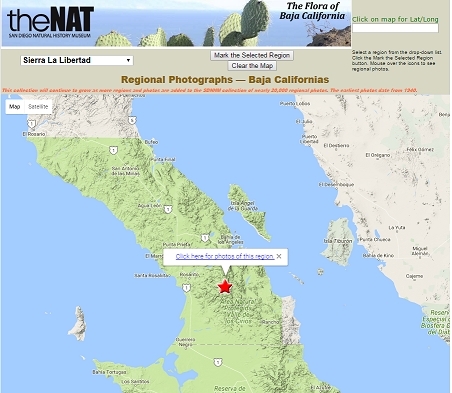 Custom GIS searching provides a powerful search tool for users who are registered in Baja Flora. These users have the ability to draw shapes — polygons and polylines — and save them by name for repetitive use. They may also call up, for GIS searches, shapes created and useable by anyone, such as the ecological regions. A shape saved by a user is available only to that user unless the user specifies it can be used by others. When in the search mode, the user can call up any shape formerly created and saved, or a public shape, and search using a "within" criteria or a "distance from" criteria. The "distance from" can also be used with a latitude/longitude point as a reference. The search results can be collections or a checklist. Over 84,000 collections are mappable, and this feature provides a facility for users to map any species on Google® Maps. Multiple species can be mapped in sequence. Each result set is listed at the bottom of the map frame, and each collection marker is clickable to reveal specific data for that individual collection. 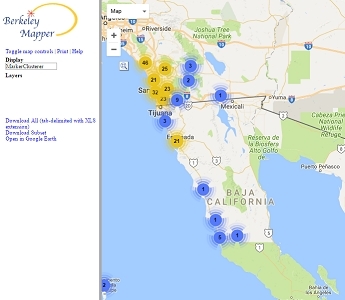 Users also have the option of using the Berkeley Mapper. The plant photo collection, in September 2016, included over 29,000 photogrpahs of 2800 distinct taxa. This collection continues to grow as Dr. Rebman and others bring more photos back from expeditions to the Baja peninsula. 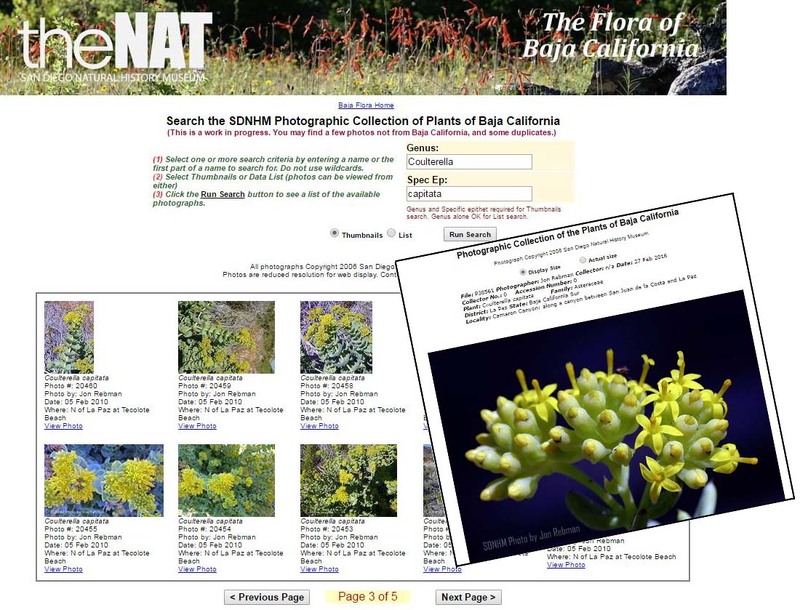 Web site users can search by plant name and get a list or a number of pages of thumbnails. Thumbnails or list items can be clicked to see a full size image. Users can be assured that each photo has been accurately identified. 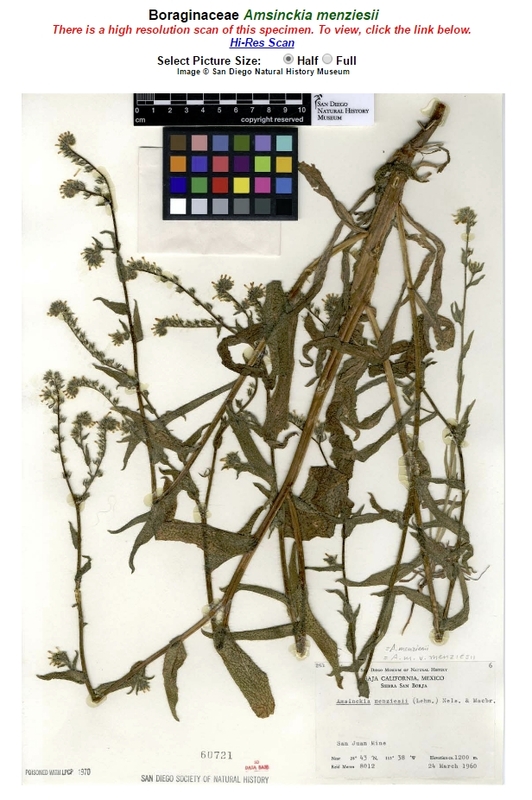 For each taxon in the collection, one specimen is selected as the voucher for that taxa. If the species is found in both BC and BCS, a voucher for each state is selected. As new vouchers are selected, or names are changed, the scans are done in high resolution. Scanned images of these vouchers are available. Users can search by species names or by genus only. In any case, the search results in a number of thumbnail images of vouchers with a summary of the data for the specimen. Users may then click on the image to then see a full page image of the specimen. use to download the high resolution image. Many regions of BC and BCS are documented in regional photographs. 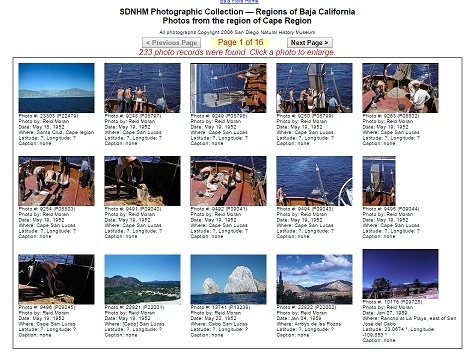 The Regional Photos page provides a drop-down list of the regions of which photos are available. Selecting one of those regions from the list places a marker on that region. Clicking the marker brings up a page or number of pages with sets of thumbnails of the images from the selected region. on any photo will open a page with a full size view of the photo. 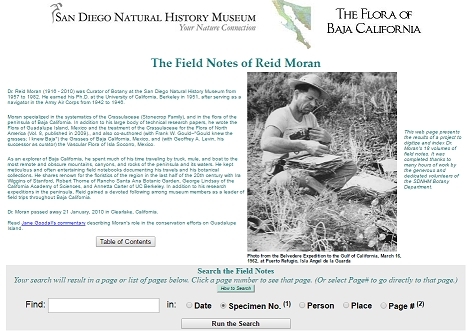 Reid Moran, the curator of botany at the San Diego Natural History Museum from 1957 to 1982, was a prolific collector of Baja plants. His collections in the SDNHM herbarium number 25,552, of which 21,589 are from Baja. As an explorer of Baja California, he spent much of his time traveling by truck, mule, and boat to the most remote and obscure mountains, canyons, and rocks of the peninsula and its waters. He kept meticulous and often entertaining field notebooks documenting his travels and his botanical collections. He shares renown for the floristics of the region in the last half of the 20th century with Ira Wiggins of Stanford, Robert Thorne of Rancho Santa Ana Botanic Garden, George Lindsay of the California Academy of Sciences, and Annetta Carter of UC Berkeley. Moran kept meticulous notebooks, and museum volunteers have scanned and indexed these books. The page here provides users access to those notes, with the ability to search by dates, specimen numbers, persons, or places.